As we were back ‘home’ in Saskatchewan for a holiday, I thought it would be neat for you all to take a break from my boring kitchen and have a peak into my Momma’s farm kitchen. As you can tell from the pictures, she’s really into antiques. She likes having a lot of interesting (non cooking related) clutter around whereas I do not. 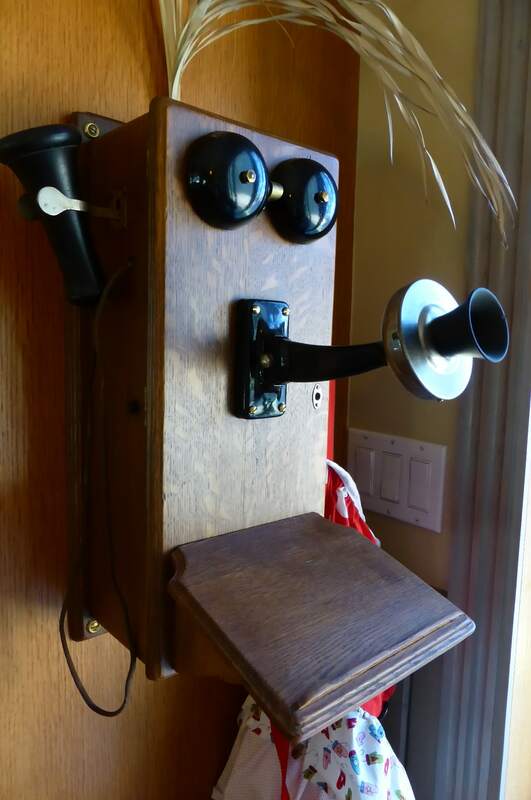 Here’s an old wooden box telephone. It doesn’t work other than to hold a small calendar which I removed for the photo. I don’t like to think of myself as old but I do remember still having a dial phone and a party line out there on the farm. I thought it was neat to listen in on other’s phone calls. What? There really isn’t much else to do on a farm when you’re seven! The mitten themed apron hanging from the telephone was made especially for my mom by my sister. My mom knits a lot of mittens; nope that’s an understatement. She basically pays for Christmas by selling home made mittens. She often makes around 3,000 pairs with lining per season. Both my sister and my mom are crafty but I missed out on those genes. 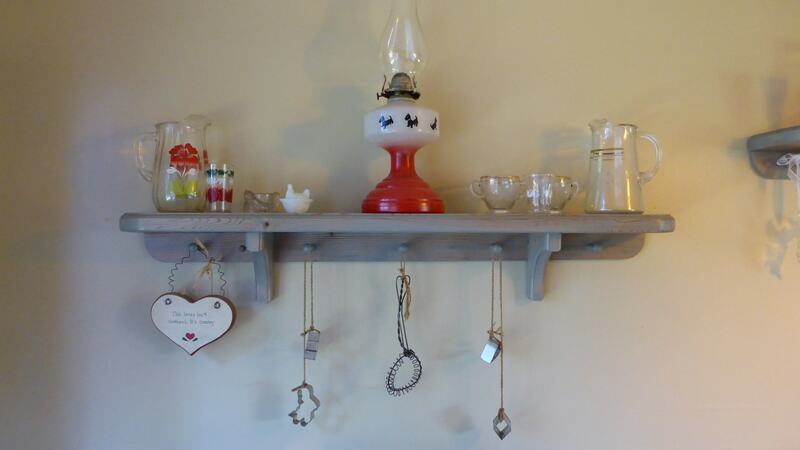 One of the shelves on my mom’s kitchen wall with various antiques. I bought her the heart sign one year for Christmas. It says, “This House Isn’t Cluttered, It’s Country!” She has definitely toned things down a bit, though she’s kept some of her favourites. 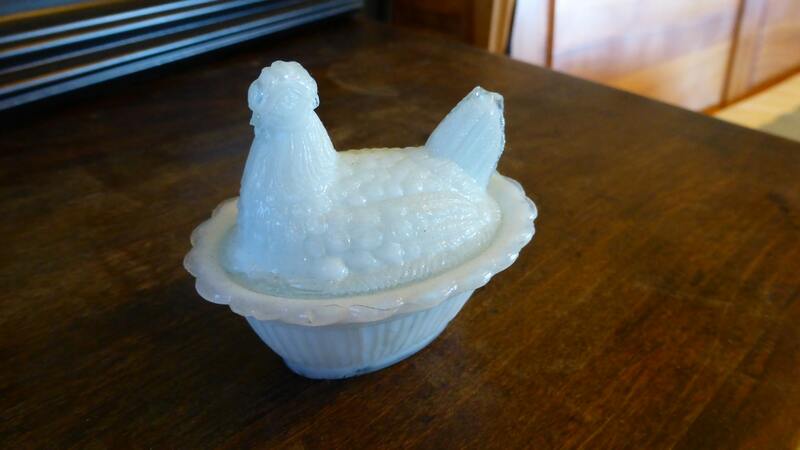 This cute little glass chicken container. 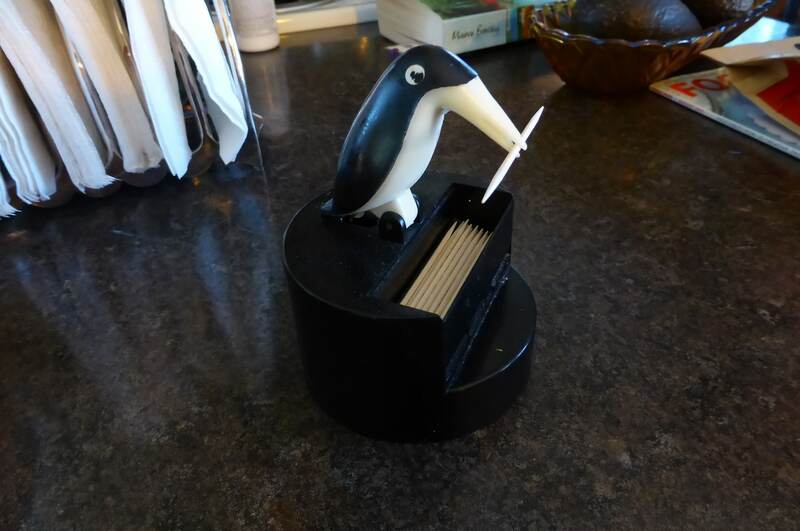 I’m not sure what it’s for, maybe it’s a pill holder. It’s really tiny and probably wouldn’t hold much else. This little guy is my favourite. If you treat him really nice he’ll give you a toothpick. When we go to the farm, we bring our own clutter. Kid number two was anxious to get some football practice in with his uncle Mitch. 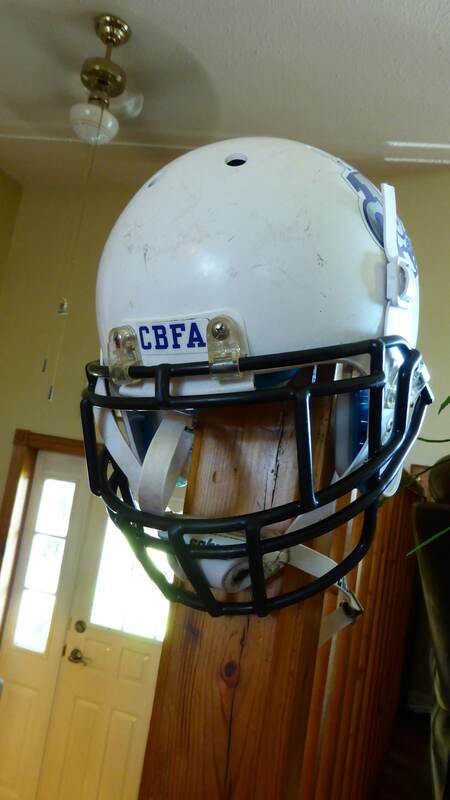 He had just received his helmet and needed to practice catching balls wearing it. So Grandma had it hanging around her kitchen for a while. One of my favourite things to eat while home at the farm is my mom’s homemade bread with local honey. 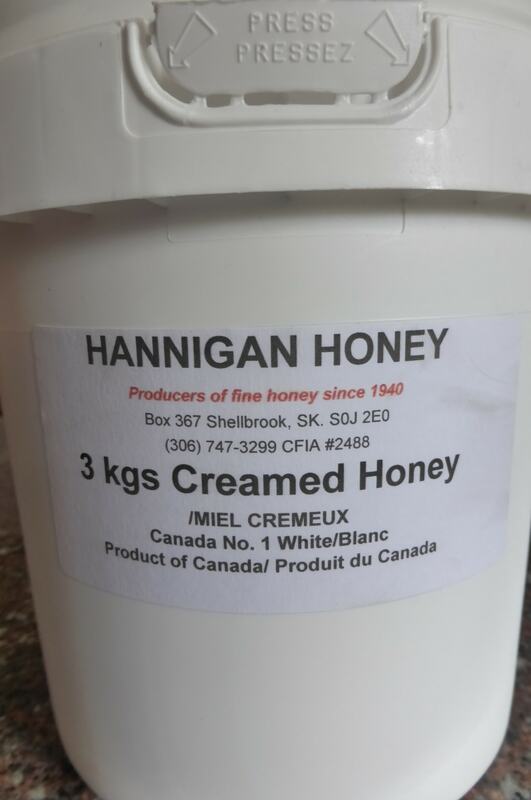 When hubby decided he needed to make a trip into Shellbrook for gas, I made sure he stopped at Hannigan Honey so we could bring some home. If Mr. Hannigan isn’t home, you can go on into the shop and help yourself to the honey on the honour system…it’s how they do things back on the farm. This 3 kg pail cost us $22. I hope you enjoyed this little break from my kitchen. 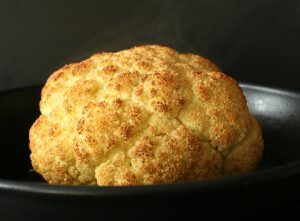 When I think of my Momma’s kitchen, I remember many delicious meals there shared with family. The first time I brought hubby home to meet everyone and my father watched in horror as he devoured a huge t-bone in minutes, lips smacking in glee. The first taste of home made sauerkraut in the fall. The MANY failed birthday cakes, including an extremely flat ‘never fail chocolate cake’ that us kids got for our birthdays….Often in late August when the corn is mature, we’ll have a meal of just corn on the cob. And my dad’s fried eggs, YUM! If we weren’t eating around the table, we’d be playing a card game and sharing a beer or two. it was nice to be home, even if it was only for a few days in August. Many thanks to Celia of Fig Jam and Lime Cordial for hosting ‘In My Kitchen’. If you want a peek into her kitchen, pay her a visit too! oops. It has a white tummy. Maybe a magpie. We have magpies here but they are not the same as Australian magpies. Can you please post a photo of a pair of your mum’s mittens? I’d love to see them! I’m still shaking my head at the 3000 number! LINED ones too! I have the winter gear buried in the backyard at the moment Celia 🙂 But I’ll see what I can do..
I’m with Celia on those mittens! I did knit 5 pairs of fingerless gloves with hats and scarves to match last year and I was real impressed with myself. Your mom is AMAZING! I don’t know about amazing..more like obsessed 😉 She even knits in the summer! G’day! LOVE the telephone and you chicken holder, true! Thanks for inviting me into your kitchen this month with its unique view too! Thanks Kim, that is exactly how I feel.